Darrell Blackwell always thought his father was evil. He didn't know the half of it. Darrell Blackwell rests his head on the grave of his sister at Arlington National Cemetery in Arlington, Virginia. Alice June Blackwell died at the age of 6 months. 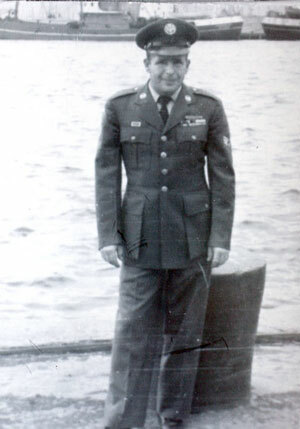 Gene Blackwell in his US Air Force uniform. Photo taken in 1952 in Korea. Darrell Blackwell pulled into Bolling Air Force Base and parked by an imposing gray building. He got out, clenching and unclenching his fists. "You've got to keep me cool, Anita," he told his sister. "I don't want to go off on these guys." Darrell is a thick man, built like a box. He forks his bristly hair into a flattop, making his head seem square. He hides behind a mask of muscle and ink; a snarling bear and gorilla snake up his hard arms. It was February, and Washington was in the grip of a wicked cold snap. Darrell, who lives in Oldsmar, didn't even have a coat. He grabbed his black binder of evidence and, shivering, led his sister to the Office of Staff Judge Advocate. Inside a large conference room, a man in starched fatigues was waiting. "Lieutenant Colonel James Dapper," the man said, extending his hand. Then he added, "I'm a little confused about what our aim is here today." Darrell glared at the man, his eyes black slits. "Our aim," he almost spat, "is to see what happened here, and why. Why did Mr. Blackwell get an honorable discharge after everything that happened? "There's nothing honorable about that man." Mr. Blackwell - that's what Darrell calls his father. He uses the name to put distance between them, as if the man had been a remote figure, of no importance. Darrell wishes it were so. Gene Blackwell, dead since 2005, scratched out a living as an Air Force mechanic. His widow and kids say he was a mean drunk. They say he beat his wife and raped his own daughter. Darrell, his youngest son, says his father flogged him with belts and wrenches and broke his nose seven times. "That's why Darrell Blackwell Does. Not. Cry." Raise a child that way and you get - well, you get the man Darrell is today: a knot of rage and self-pity and pain. He's 47; been married five times. He has a son and daughter but left them because he knew he would hurt them if he stayed. He's a recovering drug addict and alcoholic. He never got as far as high school. He reads and writes, he says, like a third-grader. A former truck driver, oil rig driller and hairdresser, Darrell has been on disability for years, ever since he crashed his motorcycle and crushed his right arm and leg. Darrell blames it all on Mr. Blackwell. He wouldn't even go to his funeral. Last September, on the first anniversary of his father's death, Darrell set out to prove that Mr. Blackwell had not been his father at all. His theory, his hope, was that his mother had had an affair while Mr. Blackwell was out of town with the Air Force. Some other man must be his true dad. If he could prove this theory, he could be all he ever wanted to be: something other than Gene Blackwell's son. To bolster his case, he collected old photos, black-and-white snapshots of his parents and brothers. He spread them across the kitchen table in his apartment. Everyone in the family has fair hair and light eyes, except Darrell. "See?" he told his wife, Carroll. "I don't look anything like them." He called relatives, asking about his father's whereabouts, his mother's fidelity. Years earlier he had asked his mother: Did you have an affair? When she denied it, he called her a liar. So he wrote to the Air Force, hoping to find that Mr. Blackwell had been stationed far away from his wife when she got pregnant. He never got a clear answer. What he got - if this was even possible for somebody like Darrell - was more pain. And another reason for revenge. One night while Darrell slept, his wife researched his family on the Internet. She typed his father's full name: Harley Eugene Blackwell. Six stories popped up in the Washington Post archives. Carroll read the first headline - and screamed. Darrell ran into the living room. She read him the story. "How? How could he do that?" Darrell shouted, smashing his fists into his eyes. "How did they get away with it?" On August 15, 1957 - two years before Darrell was born - his parents had made the front page: "Bolling Airman, Father of 4, Accused of Beating Baby Daughter to Death. Cries 'Made Me Lose My Temper.'" Gene and Patricia Blackwell had six children together; Darrell was the youngest. The baby daughter in the newspaper story had been Anita's twin. She was only 6 months old when she died. Crib death, their parents always said. All Darrell ever knew about her was her name: Alice June. The Post story said Darrell's father, then 26, had beaten Alice June at their apartment. Darrell's mother had four children younger than 4 and was pregnant again. She was 18 years old. She had waited a week to bring her injured infant to the hospital. By then, the baby was in a coma. The newspaper said, "Death was attributed to a fractured skull and a brain injury." Mug shots of Darrell's parents showed his father staring straight into the camera. His mother was looking away, her left hand hiding her face. "Jury Calls Dad Baby's Slayer," said another headline. "After the beating," the story said, "Mr. Blackwell resumed watching the television program." Patricia Blackwell tried to cover for her husband. First, she said Alice June had fallen off the couch. Later, she said she'd dropped the baby on her head - then went back to watching TV. Three months after Mr. Blackwell was arrested, the U.S. Attorney's office dropped the charge of second-degree murder against him, the paper said, "and permitted him to plead guilty to a charge of cruelty to children." Police arrested Patricia Blackwell for the same offense. Both parents got suspended sentences. And Mr. Blackwell went back to his job with the Air Force. How can you beat a baby into unconsciousness? How can you wait a week to take a battered infant to the doctor? How can you lie to your family for 50 years? Darrell kept hurling these questions at his wife. "How would you feel?" he growled, "if you just found out your dad was a murderer? And you could've grown up with another big sister? Anita could have had her twin." The discovery fueled Darrell's need for retribution. It was no longer enough to prove that Mr. Blackwell wasn't his father. Now he would set out to show that the man was a murderer - and make him pay for it. But how do you hurt a dead man? Darrell tracked down police and court records, wrote away for medical reports, found military forms that proved Gene Blackwell was an abusive drunk. Then he called his mother. He hadn't spoken to her in years. He said he was coming to Colorado to talk to her. His sister Anita met him at their mother's house. Darrell was shaking when he knocked on the door. He was so angry he worried he'd explode. Patricia Blackwell lives with her son Ronnie, Darrell's older brother. She let the visitors in, and they all sat down at the kitchen table. Anita had packed a mini tape recorder in her purse. When Darrell began interrogating their mother, Anita secretly switched it on. Later, Mrs. Blackwell told a reporter she didn't care who heard that conversation. "I've got nothing to hide," she said. "So, Mrs. Blackwell," Darrell began, "what happened in 1957 at 770 Atlantic St.?" There was a pause. "C'mon, Ma - Mrs. Blackwell. You know what I'm talking about." "I, I have no idea what happened," Darrell's mom stammered. "I still have no idea." "This girl had six months to live," Darrell bellowed. "You let him beat her to death." "I don't have to explain to you what's going on." "Please," Darrell begged. "Give us the truth." Silence. A sigh. Resignation? Regret? "I don't know if he beat her," Darrell's mother said. "I went out." More dead air. Then the tone of apology turned to accusation. "Can't I go out without you kids once in a while?" She never said Alice June's name. Or that she was sorry. Leave it alone, his brother Ronnie kept saying. Whatever happened is in the past. Darrell couldn't leave it alone. All day he'd sit at the computer, firing off e-mails filled with anger, desperation and dozens of misspellings. Aware that he was obsessing, he went to a see a therapist, but that only made him madder. He called lawyers who laughed at him, wrote Oprah and Katie Couric, Montel, Maury, Erin Brockovich. It wasn't clear what they were supposed to do for him. He just said he was seeking justice for his dead baby sister. He couldn't confront his father, so he turned his venom toward the Air Force. "I want to know why the military didn't step in," Darrell said. After all, Alice June's medical records were full of damning evidence. "That baby had been brought in before, covered in bruises. A doctor wrote she was malnourished - she was 6 months old and only weighed 11 pounds. Why didn't anyone hold the parents accountable?" He wanted answers. So he maxed out his credit cards, borrowed money from a friend and bought two plane tickets to Washington. His plan was to meet with an Air Force officer, someone who might be able to help him dishonor his father. He invited his sister, Anita. "For your birthday," he told her, gifting her the trip. On Feb. 9, she would turn 50. Her twin sister would have too, if she had survived. At the Air Force base, Darrell pulled out his binder of evidence and opened it on the long conference table. Lieuenant Colonel Dapper and a man named Dennis Matthews leaned in to see. Matthews is a victim advocate for the Air Force. He's the man Darrell had to go through to get to Dapper. "Look, right here: The man admitted to beating a baby to death," Darrell said, pointing at the Post article. "It's appalling to me, sirs. Why didn't the Air Force kick him out for what he did?" Darrell showed them Alice June's medical records, Mr. Blackwell's police reports. He showed them the scars his father had left on his forehead, lip and nose. He made them look at a photo of Alice June, smiling in a polka dot dress. Darrell said he wanted the discharge dropped to dishonorable. He wanted his father dug up and moved to a civilian cemetery. He wanted the military pension stripped from his mother. The officer shot a glance at the victim advocate. What was this? In all his years in the service, he'd never had anyone ask to have someone's discharge downgraded, much less to have a serviceman exhumed. "Do you know what the D.C. police did?" Dapper asked the victim advocate. "I looked into that, sir," Matthews said. "My theory is that, since Mrs. Blackwell also was held, and they gave conflicting statements, the prosecutor took a plea bargain. "Since it happened off base, the military thought it was being handled in the civilian world," Matthews said. "So they took no further action." Darrell shot up. "So that's it?" he screamed. He crumpled back down. "My life has been totally obsessed with this. Maybe that's wrong," he moaned. "But in my opinion, the military dropped the ball. They let him go on, so he could have other kids, so he could abuse us too. "Murder is murder," Darrell hissed. "And he got away with it." The officer nodded. "If something like this happened here today," he said, "I can assure you we would pursue something much worse than a dishonorable discharge." But you can't downgrade someone's discharge to "dishonorable" without a court-martial, the officer explained. And you can't court-martial a dead man. "The best you can hope for," he said, "is to get it changed to 'under less than honorable conditions.'" "Why did you let this man get away with murder?" Darrell barked. "You have to trust me on this," Dapper said icily. "I've been a lawyer for 12 years. You need corroborating evidence to convict someone of murder." Again, Darrell jumped up. "I know that. Don't talk to me like I'm dumb," he yelled. "You're looking at me like I'm a dog." Matthews interrupted, saying he'd prepare some papers for Darrell to sign, requesting that the discharge be downgraded. "Can I ask a question?" Anita almost whispered. The men turned to her, as if seeing her for the first time. "I just want to know," she said, "how can we find out if my sister got a funeral? Or where she was buried?" That night, Darrell called his mother from the motel. They hadn't spoken since that day in Colorado five months earlier. He put his cell phone on speaker so Anita could hear. "I saw Bolling Air Force Base," he said as soon as she answered. "I've been there, Ma . . . Mrs. Blackwell. I talked to an officer today. And tomorrow we want to see the baby. No one has remembered her, all these years you told us lies." "She's been remembered. She's always been remembered by me," his mother said defiantly. She said Alice June was buried at Arlington National Cemetery, only a few miles from where Darrell was staying. She had been at the small funeral, but no one had been to the grave since. "What about us, Ma?" Darrell demanded. "Why didn't you tell us so we could have remembered?" "Well, why'd you go digging into this?" "You know that," Darrell said, exasperated. "I was trying to prove Gene Blackwell wasn't my father. . . . Maybe I wasn't the best son. But at least I didn't let someone kill one of my kids." "That's enough," she said. "Enough." Click. Later, Patricia Blackwell talked by phone to a reporter. She laughed at the idea that Darrell is not Gene Blackwell's son. "Look at him," she said. "He's just like his daddy." The next morning, Darrell and Anita began weaving their way through marble markers at Arlington National Cemetery. Anita fell behind. Today was her 50th birthday. For the first time, she would be able to share it with Alice June. As Darrell plowed ahead, Anita ambled down a slight ridge, where a trio of magnolias spread their fleshy leaves above the snow. Something was drawing her. "There it is!" "Alice June Blackwell, Feb. 9, 1957 - Aug. 10, 1957." Darrell limped over and ran his thick finger along the letters. "Poor little thing," he cooed. "I'm so sorry no one's ever come to talk to you. We never knew where you were." Anita stood a few feet away, sniffling under the biggest magnolia. "I wish I could've been there to protect you from that monster," Darrell said, hugging the tomb marker. "There's so much I want to tell you." He lowered himself into the snow, sat on the grave. The first tears he shed in 40 years felt warm on his frozen face. "I love you," he told the etched letters. "I'm so sorry. Happy birthday." He leaned over and kissed the cold stone. Three months have passed since Darrell met with the Air Force officer. He recently got a form back saying his dad's discharge can't be downgraded. So he has been calling congressmen. He's still hoping - somehow - to get his revenge. A simple DNA test would tell him if Gene Blackwell was his real father, but he no longer wants that information. "Now that I know how bad he really was," Darrell says, "it would kill me to know, for sure, I was related to that man." He won't talk to his mother or brother. But he calls Anita every week. His quest brought them closer than they've ever been. Darrell feels a kinship with his lost sister, too. Anita and Alice June, he says, are all he wants from his past. They're family. They're Blackwells. Times staff writer Lane DeGregory was with Darrell Blackwell in Washington when he questioned the Air Force officer and visited his sister's grave. The account of Darrell's conversation with his mother in Colorado is based on the tape recording his sister made there; the Times told Mrs. Blackwell that a reporter had heard the tape and she did not object to the newspaper quoting from it. DeGregory was also present when Darrell called his mother from Washington; Mrs. Blackwell was told that a reporter was listening, and she later gave an interview to the Times. The scene describing Carroll Blackwell's discovery of the Washington Post articles was re-created through interviews with her and Darrell.